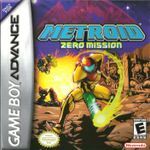 Metroid: Zero Mission​ (メトロイドゼロミッション?) is an action-adventure video game developed by Nintendo R&D1 for the Game Boy Advance handheld console. It was published by Nintendo in North America in February 2004, in Australia in March 2004, in Europe in April 2004, and in Japan in May 2004. It is part of the Metroid series, an enhanced remake of the original Metroid game designed to retell the game's story. Like the other titles in the series, it features intergalactic bounty hunter Samus Aran as the player-controlled main character. Samus Aran travels to Zebes after learning that Space Pirates are experimenting with Metroids in an attempt to duplicate them and use them for their own gain. Samus finds and destroys Mother Brain, the mechanical life-form that controls the Space Pirates' base. However, while she escapes the planet in her gunship, she is attacked by Space Pirates, causing the ship to crash back onto Zebes, near the Space Pirate Mothership. Samus decides to explore the ship and encounters Ridley Robot, who she defeats. Finding a shuttle, she uses it to escape the planet as the Metroids and the Space Pirates' research are destroyed in an explosion.